Nurturing Creativity in the Classroom is a groundbreaking collection of essays by leading scholars, who examine and respond to the tension that many educators face in valuing student creativity but believing that they cannot support it given the curricular constraints of the classroom. Is it possible for teachers to nurture creative development and expression without drifting into curricular chaos? Do curricular constraints necessarily lead to choosing conformity over creativity? This book combines the perspectives of top educators and psychologists to generate practical advice for considering and addressing the challenges of supporting creativity within the classroom. It is unique in its balance of practical recommendations for nurturing creativity and thoughtful appreciation of curricular constraints. This approach helps ensure that the insights and advice found in this collection will take root in educators' practice, rather than being construed as yet another demand placed on their overflowing plate of responsibilities. "What do leading scholars and researchers in the field of creativity think about developing creativity in the classroom? This fascinating book offers practical advice and concrete suggestions from many different perspectives and addresses a number of important questions. How does brainstorming in the classroom increase content knowledge? What are ‘ideal acts’ of learning? How do you combine creative and critical thinking in the curriculum? 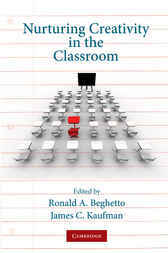 Beghetto and Kaufman in their excellent synthesis offer twenty key points about nurturing creativity in the classroom. This book is a very valuable addition to the field of creativity and education."